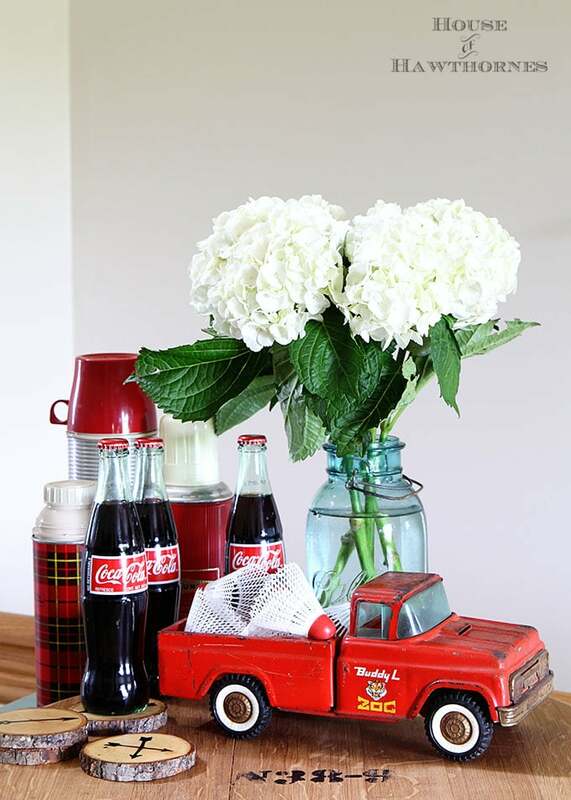 Not that the weather here in Ohio has been cooperating, but yard sale season is starting to heat up and I’ve compiled my list of things we need to find at yard sales this summer that we can also use to decorate our houses. 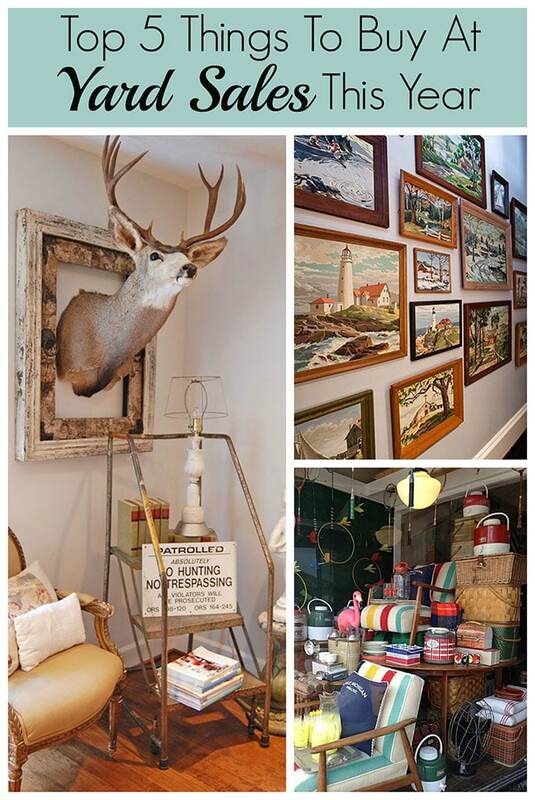 Because yard sales are a great place to find inexpensive (ridiculously inexpensive), fun, quirky finds for the home. So without further ado, I give you my . . . 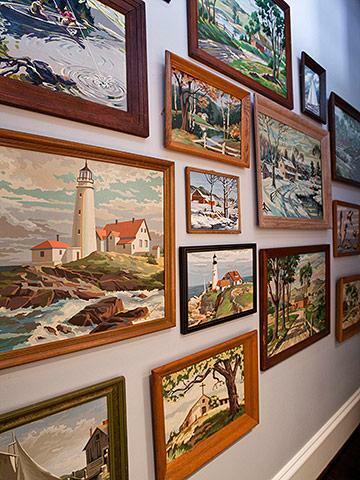 I love a good “tacky” paint by number in a vignette and even more so when done as a whole gallery wall! Why oh why did I throw away the horse I painstakingly painted when I was ten years old. 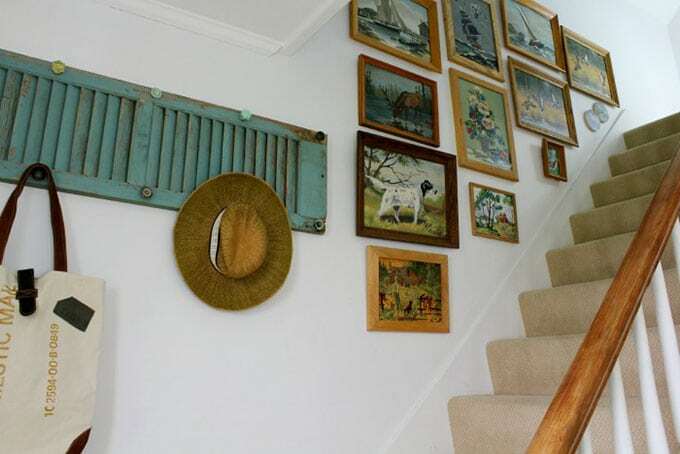 Pam at Retro Renovation has a nice guide all about vintage Paint By Number sets if you want to know more about them. 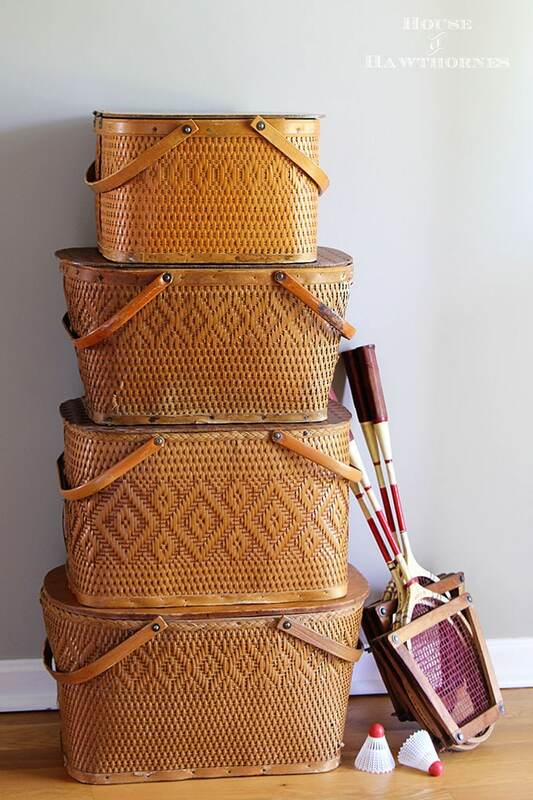 Don’t worry, you don’t have to actually USE it (wouldn’t want to break a sweat or anything), but vintage summer sports gear is cute to put on the porch or use in the house for a touch of summer home decor. And for some reason, people at yard sales have no idea how desirable this stuff is. Anything from croquet sets to badminton racquets to bow and arrow sets are fair game. 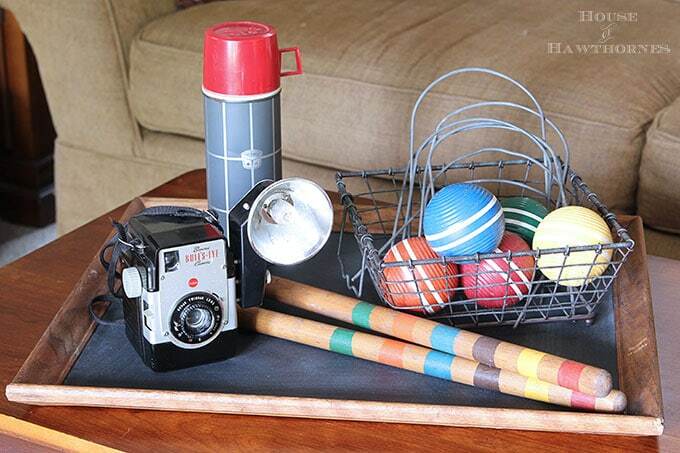 croquet balls, wickets and goal stakes on the coffee table. 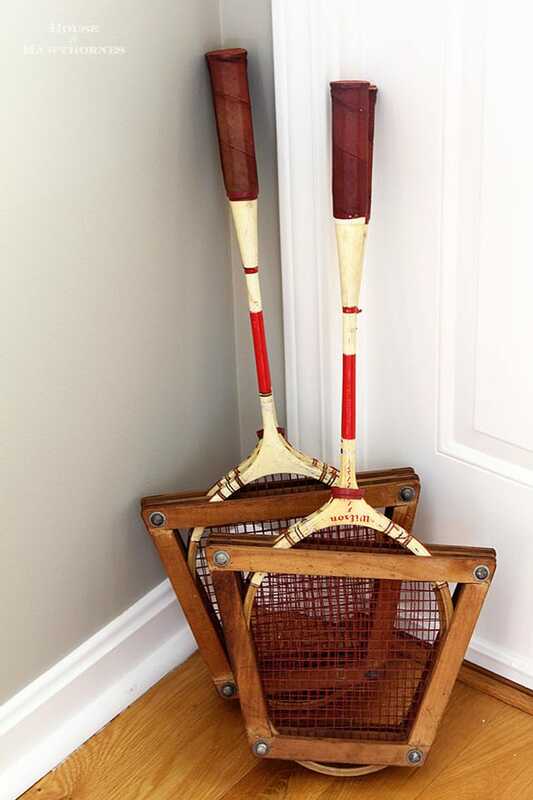 In my Vintage Eclectic Style – Kicking Traditional To The Curb post I show some vintage badminton racquets simply leaning up beside the front door. 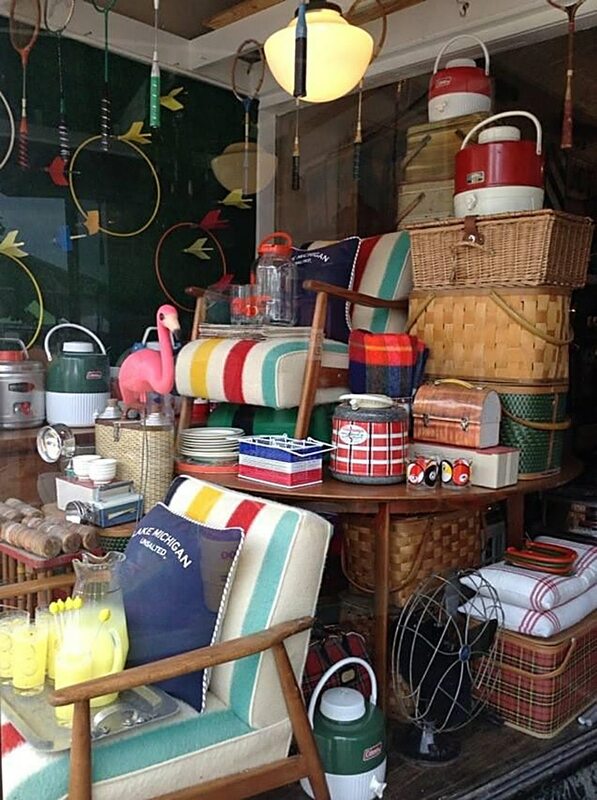 Or you can throw some shuttlecocks in a truck and call it summer like I did in my Vintage Eclectic Summer Vignette. BTW, this is in no way an ad for Coke. I like the stuff, but I really was just using the bottles for another pop of red. 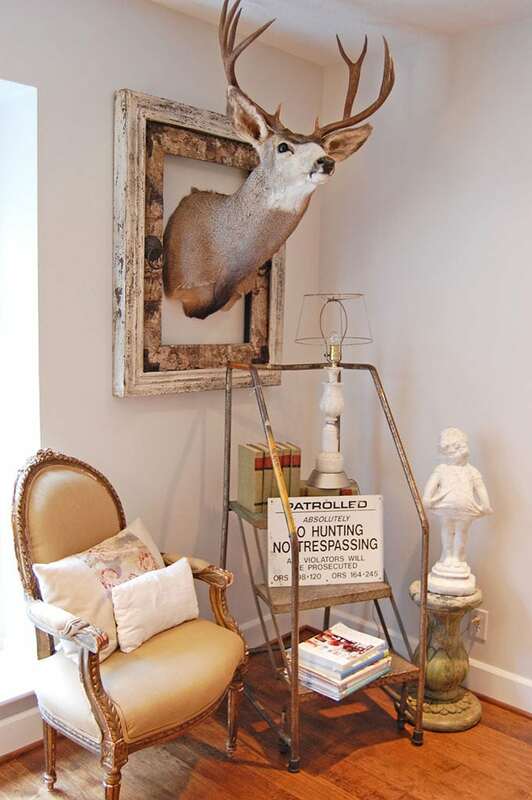 Deer heads, antlers, stuffed cats. It’s all good. Although, probably the dumbest thing I ever bought at a yard sales was a set of turkey feet. Claws and all. So yes Virginia, you CAN go overboard on the dead animal thing. 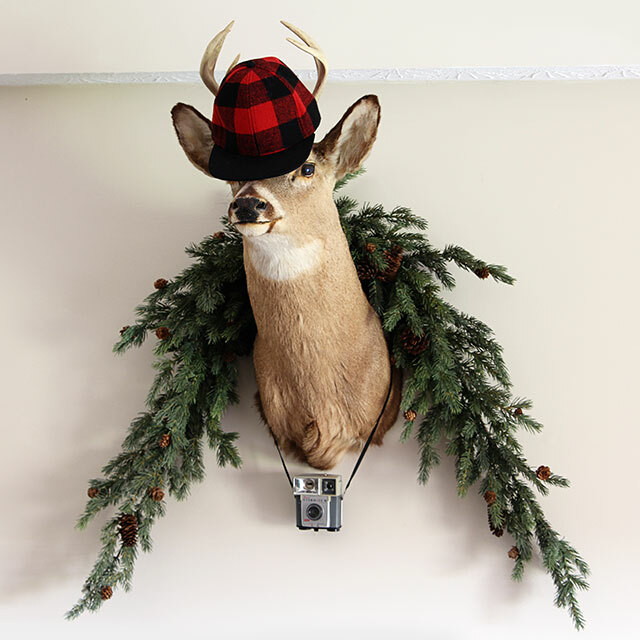 But a good head does look darn cute in a cabin or holiday theme (may they rest in peace). 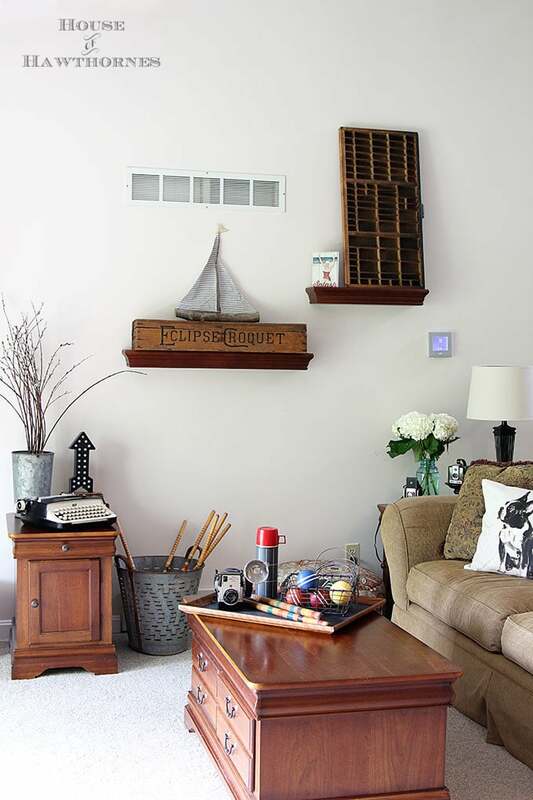 Of course, there’s always my friend hanging out in my living room from my Vintage, Rustic, Industrial Holiday Home Tour. Yogi Bear had a soft spot for picnic baskets and so do I.
I keep all sorts of things in my picnic baskets and it’s rarely a soggy sandwich. They’re great for hiding craft supplies and fabric. 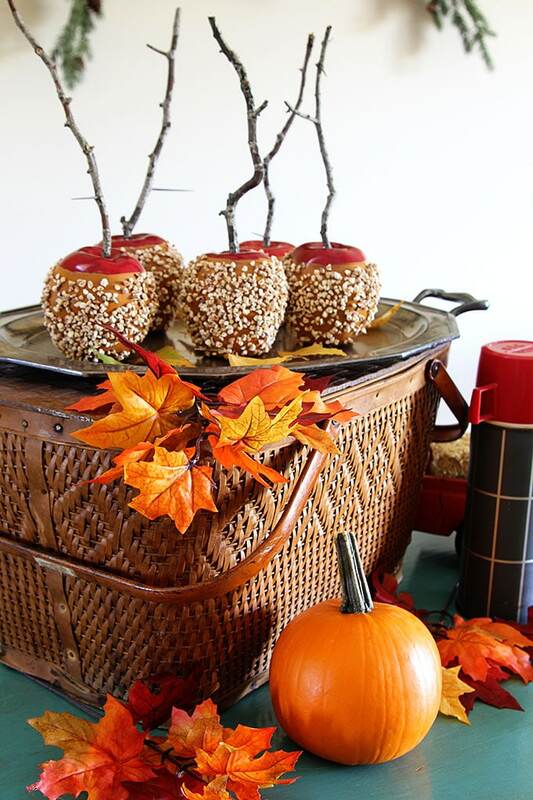 Or for holding a tray of faux caramel apples. You knew that one was coming! Thermoses are just too darn cool and too darn cheap at yard sales not to buy up every single one you find. I like to group them together. 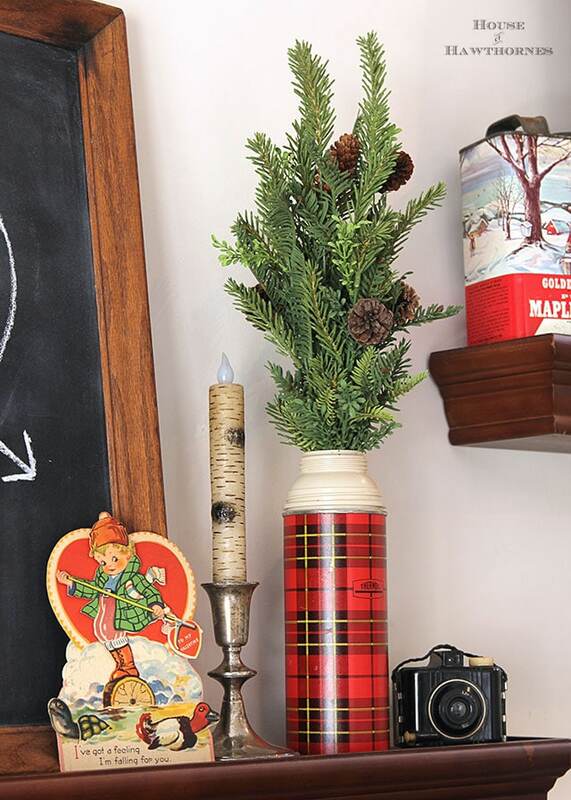 And sometimes use them as vases like I did in my Valentine’s Day Chalkboard Vignette. One of my most fun finds this past year was an Aladdin thermos bottle with an original label still attached. You never see THAT! Wow, that sounds dorky, but some people love their Star Wars . . . I love my thermoses. I even made a lamp out of a Thermos jug. 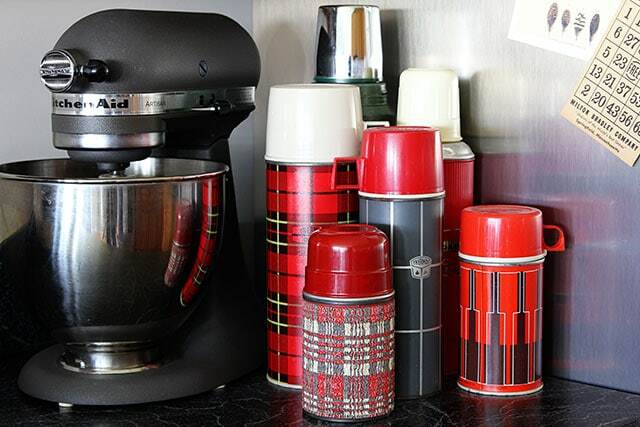 I may have met my match for thermos collecting though with Jann at Have A Daily Cup Of Mrs Olson. So that’s my top 5 Things To Look For At Yard Sales This Year, what’s on your list? After I wrote this piece some blogging friends decided to compile their own lineup of The Top 5 Things To Look For At Yard Sales. 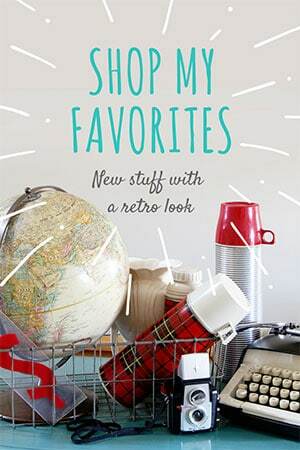 Pop on over and see what made their lists! LOVE this. I saw the neatest thermos the other day thrifting. It was yellow so I let it go. Now I am having buyers regret. Silly girl! How are you feeling now? Are you back to normal yet? Still struggling with breathing, congestion. and vertigo. How about you? I definitely need to think about what I’m hunting for this summer! The first yard sale route I’m doing is scheduled in 25 days!! Would you care if I linked to your post? Maybe we can get a few other bloggers/garage sale junkies to join us as well? Love the top 5 and with Brimfield less than a month away we should find all of these and sell the ones we already have too many of! great post. 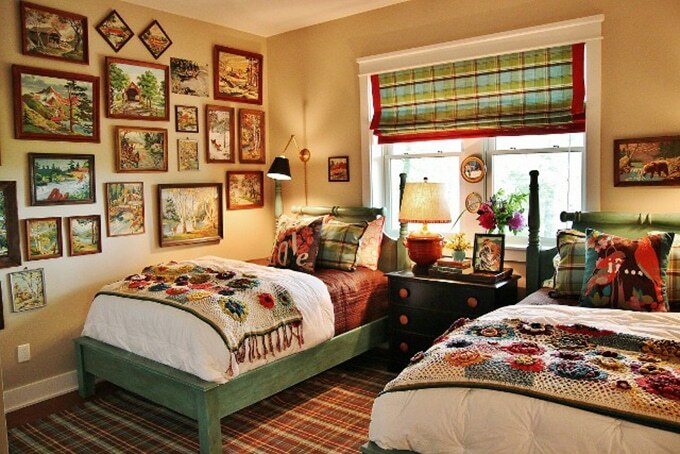 I would LOVE to get to Brimfield one of these days! It’s on my bucket list! You have some great ideas on what to look for. Thanks so much for the information. I don;t do them anymore as I am trying to get rid of a lot of stuff and down size. Everything on your list is also on MY shopping list and gets hauled to the Aframe. Nothing like hiding collections at two houses!! Yes to it all, Pam!!! I just so happen to collect vintage camping stuff so I’m off to a good start. Oooh, I love all your suggestions of things to look for! I’m so excited for yard sale season! I love it all, Pam! I can’t wait until the sales start here! I would enjoy seeing a post on hunting yard sales for things to use in the garden, such as galvanized buckets, the ladders you posted about recently, etc. 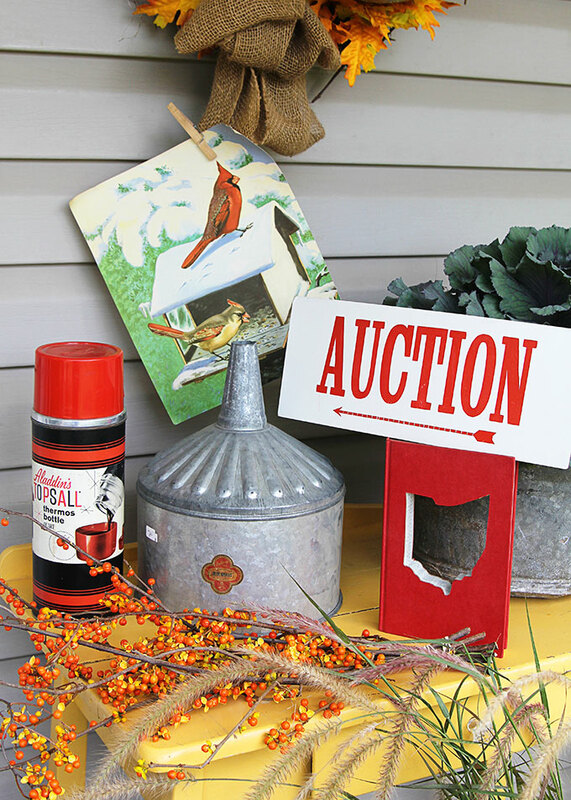 What have you used in the garden that you have gotten at a yard sale for dirt cheap? Thanks in advance! I had to see what’s in this year to see if my merchandise will sell at my next garage sale, and I’m happy to say I’ve got a few of the items you’ve featured. I’ll be looking for small inexpensive bicycles at the sales I attend. Happy junking! I hunt for some of the same items. I love red things and rusty things. Mostly I love anything with age. I keep a list of items that sell well and keep a sharp eye looking for them. Love this post. Thank you Donna, glad you enjoyed it! Red is so versatile isn’t it. You can use it for 4th of July, Christmas, Valentine’s Day, it never goes out of “style”. I look for unique watering cans, still usable ones. Thanks for the inspiration, Pam! 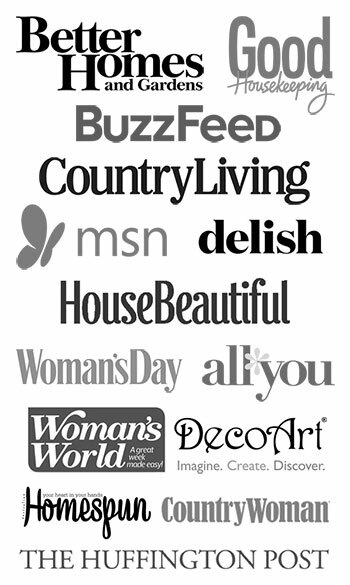 LOVED your list, by the way–happy hunting! I had to come back over to thank you for letting us use your idea for a blog hop. It is so much fun to see all the different items on the lists. We hunt for many of the same things. In fact it is Friday and I’m writing comments on blogs rather than being out on the hunt. Gotta go. I actually missed the start of an estate sale this morning 🙂 Saturday is 1/2 price day so probably better I didn’t go today anyhow! It seems that thermoses are a great theme for several of us. You do take the prize for the most unusual item tho – dead animals! Cracked me up! I never met a thermos I did not love! Or want to buy! Love your list Pam, and thanks for letting us get in on this with Melissa. Although they didn’t make my list I pick up practically every picnic basket that I see. I just love the way they look, and the paint by numbers are awesome and a have a few. I might just have to add that to my list. Well, I just don’t know. Maybe it’s my age and I grew up using those old thermoses, but they just don’t appeal to me as decorative items. Now, if they had great resale value, maybe I could work up a little enthusiasm. And I can’t say I am interested in hanging dead animals on my walls. The picnic baskets are more appealing, although, when I stores stuff I need it to be in something that is mouse-proof. I do kind of like the old paint-by-number canvases. I painted a pair of Roy Rogers and Dale Evans when I was around ten, which I still have. It certainly is interesting the things that people decide they like or are “in”. Aren’t we all just unique and in our own class with our tastes and loves? Variety–the spice of life, as they say! Well, I hope all of you are successful in your yard sale searches for all those prized items that are “in” this summer. I will not be any competition for you, promise! Oh, I just wanted to add that I am working on my own list of things I look for at yard sales and will share it soon. I’m sure you all will find it “interesting” and perhaps quite out of fashion! I’d love to see your list Naomi! I wonder if we’re around the same age though? I’m going to be 55 shortly. I think one of the main reasons I love thermoses is that I can remember them from when I was a kid. My parents never bought me a real lunchbox (we didn’t have a lot of money, so I always had to use a brown paper lunch sack) and I was always envious of the kids who got to carry the lunchboxes. I think one of the first thermos/lunchbox items I bought was one of the plaid lunchboxes I remember the other girls having in 1st grade:) And then I found a matching thermos to go with it and then it’s snowballed from there! Pam, thanks so much for sharing this over at the Favorite Five Party last month! I know this is probably a decades old post by now 😉 but I had to tell you that I have a tabletop croquet set and tabletop bowling set we used as kids! And it was old then – still have a soft spot for these old pieces! 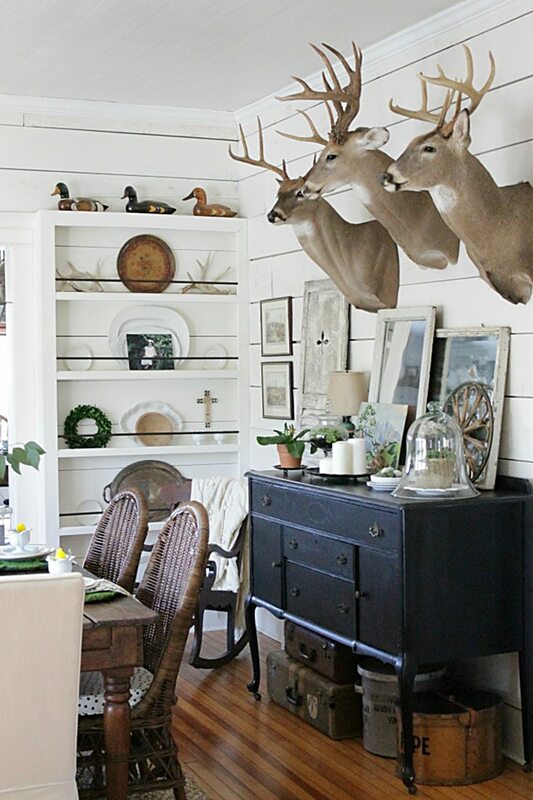 What a great post – love it all (well, except for the deer heads and/or other dead animals) and especially love the chair covered in the striped blanket! And the paint by numbers (I have cat ones)…and the thermoses! No, it’s really only from last year 🙂 It’s really odd, but I just can not find paint by numbers any more. I used to see them all over the place, but I haven’t ran across a single one all summer.